While watching the kingfishers today everything initially appeared to be OK. Both birds were bringing fish into the nest, the male was still bringing very large fish in, although he now seems be getting the youngsters to take them, even if it means him flying in to the nest 3-4 times. The female was hanging around a bit more, begging for fish from the male as well as taking fish into the nest. This is typical behaviour when the female is getting ready to start another brood, and she was also making some initial attempts at starting a new burrow a couple of yards from the active burrow. With less than 2 weeks to go before the first brood are due to fledge, everything seemed to be running smoothly, when the male flew over and landed on a branch in front of me to preen. Almost immediately I could see that something was not right with his right eye, and a closer view showed that it appears to be clouded over. the male is holding it half shut most of the time and it really doesn’t look good. 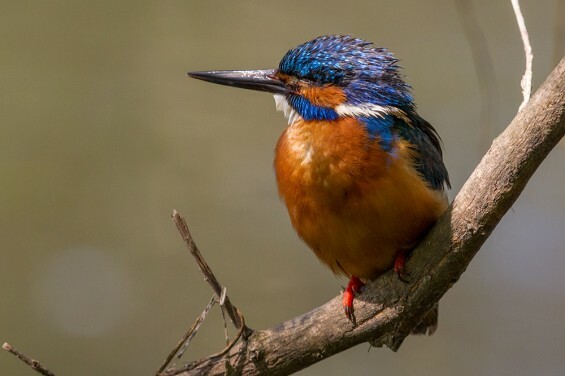 Life is seldom straightforward for kingfishers, they live a high risk lifestyle plummeting into water many times each day, so I suppose it’s inevitable that birds will occasionally pick up injuries. For a kingfisher the loss of sight in one eye has got to be fairly catastrophic as they rely entirely on their eyesight for hunting, which I just don’t think would work with monocular vision. For the time being the good news is that the male is still bringing fish in regularly, so I assume he still has reasonable sight in the eye. With 10 days to go till the first brood fledges, I’m hopeful that the brood will be OK, but unless the injury heals, then I don’t hold out too much hope that this pair will be able to raise a second brood. For now all I can do is keep an eye on things and hope for the best, kingfishers are tough little birds, so for the moment I’m hoping it’s something that will heal by itself. Posted in Kingfisher Diary and tagged Alcedo atthis, injury, Kingfisher.